Driving through the crowded streets of the sprawling Kibera slum in Nairobi, it’s nearly impossible to describe how many people live in this area of about 400 hectares, the equivalent of just over half the size of Central Park in New York City. Everywhere you look there are people – between 700,000 to one million people live here in what is likely the largest slum in sub-Saharan Africa. And despite the challenges people in Kibera face — little space, a dearth of water and sanitation services, and a lack of land ownership are the big ones — some residents manage to thrive. We met a “self-help” group of female farmers in Kibera who are growing food for their families and selling the surplus to their neighbors. Such groups are present all over Kenya, giving youth, women and vulnerable people the opportunity to organize, share information and skills, and ultimately improve their well-being while giving them a voice that otherwise would not be heard. The women we met were growing vegetables on what they call “vertical farms/gardens.” But instead of skyscrapers, these farms are in tall, recycled sacks filled with soil, and the women grow crops in them on different levels by poking holes in the bags. They mainly plant seeds and seedlings of spinach, kale, sweet pepper and spring onions. The women’s group received training, seeds and sacks from the French non-governmental organization Solidarites to start their sack gardens. More than 1,000 women in this neighborhood are growing food in a similar way. It is something that the International Committee of the Red Cross recognized as a solution to food security in urban areas during the 2007 and 2008 political crisis in the slums of Nairobi. For about a month, no food could enter these areas from rural Kenya. But most residents didn’t go without food because so many of them were growing crops — in sacks and on vacant public land, such as along rail lines and river banks. These small gardens could produce big benefits in terms of nutrition, food security and income. All the women told us that they saved money because they no longer had to buy vegetables from the markets or kiosks. They said the vegetables were fresh and tasted better because they were organically grown, although that sentiment also might come from the pride of growing something themselves. Mary Mutola has farmed this land for over two decades. She and the other farmers, mostly women, don’t own the land where they grow spinach, kale, spider plant, squash, amaranth and fodder. Instead, the land is owned by the National Social Security Fund, which has allowed the women to farm through an informal arrangement. In other words, the farmers have no legal right to the land. They have been forced to stop farming more than once over the years, and although they are harassed less frequently, they still face challenges. About a year ago, the city forced them to stop using untreated wastewater (sewage from a sewer line which they tapped into) to both irrigate and fertilize their crops. Although wastewater can carry a number of risks, including pathogens and contamination from heavy metals, it also provides a rich — and free — source of fertilizer to farmers who have no money to buy expensive fertilizer. And because of longer periods of drought (likely a result of climate change) in sub-Saharan Africa, the farmers were not forced to depend on rainfall to water their crops. But even with the loss of their main water supply and nutrient sources, Mutola and the other farmers are continuing to come up with innovative ways of growing food crops and incomes from this farm. In partnership with Urban Harvest the farmers are not only growing food to eat and sell but, perhaps surprisingly, also becoming suppliers of seed of traditional leafy African vegetables. These include amaranth, spider plant and African nightshade for the commercial rural farmers who supply Nairobi with these high-demand commodities. Kibera farmers have always grown fodder for livestock feed for both urban and rural farmers. But by establishing a continual source of seed for traditional African vegetables, they’re helping dispel the myth that urban agriculture benefits only poor people living in cities. 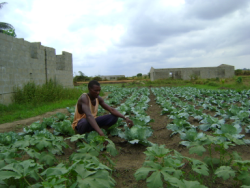 Using very small plots of land, about 50 square meters, and double beds, the farmers can raise seeds very quickly. Fast-growing varieties like amaranth and spider plant take only about three months to produce seeds, worth roughly 3,000 Kenyan shillings (about US$40) in profit. And these seed plots, because they are small, take very little additional time to weed and manage. The future for these farmers continues to be uncertain. Their land could be taken away, the drought could further jeopardize their crops, and the loss of wastewater for fertilizer could reduce production. But they continue to persevere despite these challenges. Danielle Nierenberg is a senior researcher with the Worldwatch Institute; Nancy Karanja is a professor at the University of Nairobi; and Mary Njenga is a Ph.D. student at the University of Nairobi. A version of this article also appeared in the Omaha World-Herald. November 16, 2009 Addis Ababa (U.S. Embassy): The United States Agency for International Development’s (USAID) Urban Gardens Program today launched a two-day conference called “Beyond Urban Gardens: Meeting the Growing Needs of Ethiopia’s Urban Population.” The conference highlights the challenges and the opportunities for urban gardening in combating HIV/AIDS and addressing food security, livelihoods, and health issues of urban populations in Ethiopia. The USAID Urban Gardens Program for HIV-Affected Women and Children, funded by the U.S. President’s Emergency Plan for AIDS Relief (PEPFAR), began in Ethiopia five years ago. Since October 2008, the program has helped more than 15,000 women and children and 5,000 households to generate income, adhere to AIDS treatment protocols, improve their nutrition and health, and boost their attendance at school. The program operates in six cities — Adama, Addis Ababa, Awassa, Bahir Dar, Dessie, and Gondor. In these urban areas, the USAID Urban Gardens Program creates school and community gardens using water saving methods such as trickle and drip technologies. Where possible, the program also has promoted the cultivation of fruit trees and the raising of poultry. While supporting the development of urban gardens in Ethiopia, the USAID Urban Gardens Program also assists program participants through referrals to health services offered by government and community-based organizations. More and more, people worldwide are planting urban gardens as populations in cities continue to grow and health and livelihood needs increase. First Lady of the United States Michelle Obama raised the profile of urban gardening recently when she invited a group of children to the White House in March to help her plant a vegetable garden on the White House grounds, the first such garden at the White House in 60 years. The Ethiopian Urban Agriculture Office used the conference to release its draft urban agriculture strategy. As part of the “Beyond Urban Gardens” conference, Ethiopian youth involved in USAID Urban Gardens Program will share their experiences and best practices via digital video conference with teenagers from a high school in Detroit, Michigan, who also engage in urban agriculture.